1 Fill a 5.5 quart pot, 2/3 full, with water. Add 1 tsp oregano & 1 Tblsp salt, cover & set aside while preparing the chicken. 3 Grease the bottom of two 8" x 6" glass baking dishes, each with 1 tsp EVOO. 4 Place a chicken breast in each, sprinkle with salt & pepper. 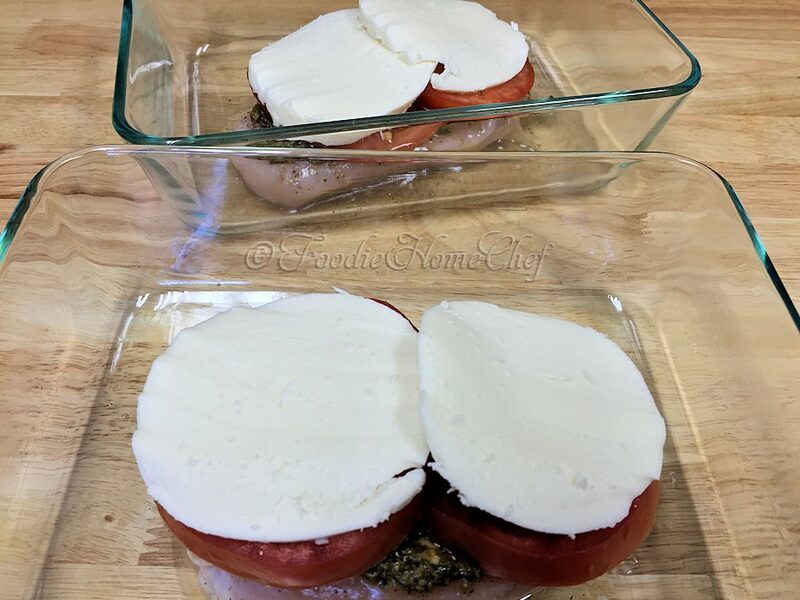 On each; spread on 2 tsp pesto, top with 2 tomato slices, add a little salt & pepper, then evenly distribute 1/2 the mozzarella on top. 5 Bake on middle oven rack for 30 to 35 minutes or till chicken is cooked through to 160° & cheese is browning a bit. 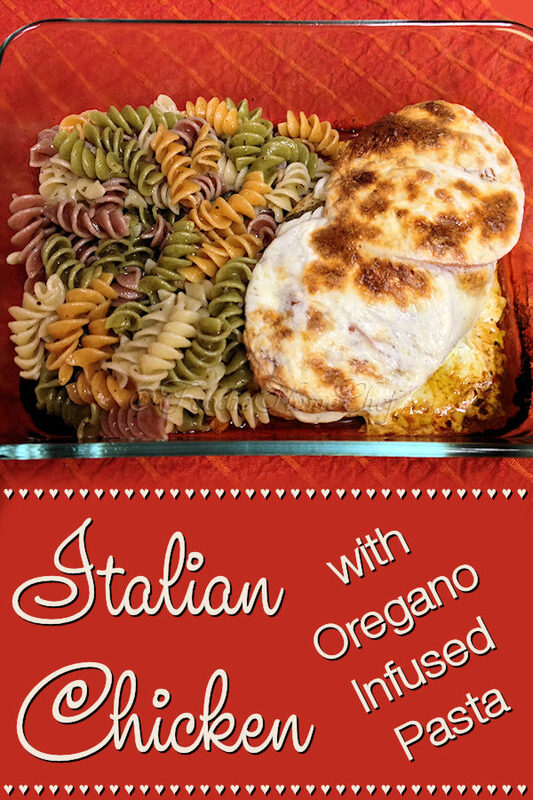 Remove from oven & set aside while you cook the pasta (see Tip# 3). 6 Bring the oregano water to a boil, add pasta & cook according to package directions till al dente. 7 Drain pasta & return to pot. Add butter & allow to melt. Add 1/4 tsp oregano, 1/8 tsp garlic & pepper to taste, stir to coat. 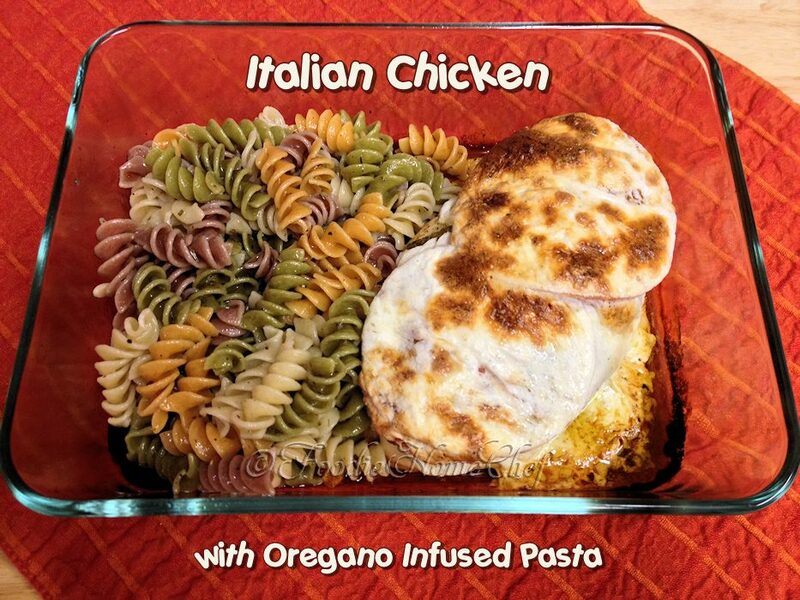 8 Slide chicken breasts to one side of each baking dish. Add pasta & serve right in baking dishes. 1 You'll find commercially prepared pesto in most supermarkets. I suggest buying a good quality made with EVOO or making your own from scratch, which has a far superior taste to store bought & it freezes beautifully, so you'll always have some on hand for recipes. 2 You can prepare the chicken, with toppings, in advance. Cover & refrigerate till ready to bake. 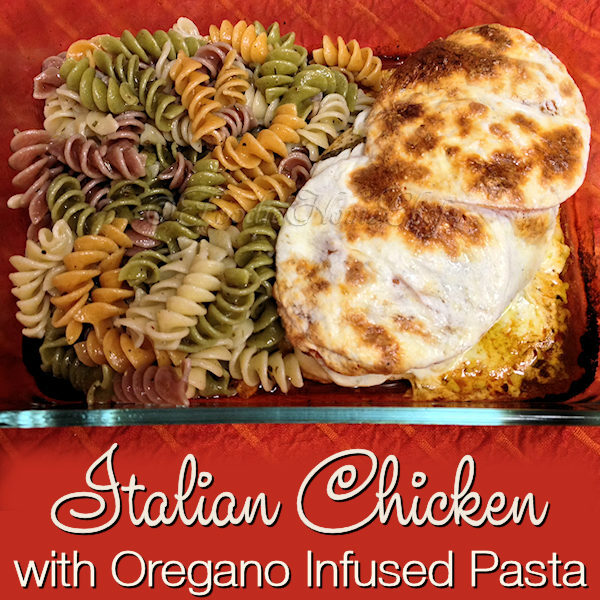 3 The chicken will continue to cook as it rests, while you make the pasta, reaching the safe temperature of 165°.